Dias y Flores is one of the oldest and nicest gardens in the neighborhood with a mix of everything on its deep, somewhat narrow lot. The first surprise is the use to which glass bottle bottoms have been put; quite cleverly they have been inserted into geometric patterns to embellish its brick paths. 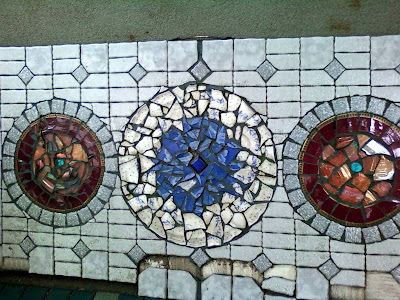 Then there are wall mosaics, equally clever and beautiful. It has individual vegetable plots, herbs, and communal areas which include seating and trees, shrubs and flowers. It also has a relatively diverse membership including founding Latino members as well as brand-new ones who just moved into the neighborhood.